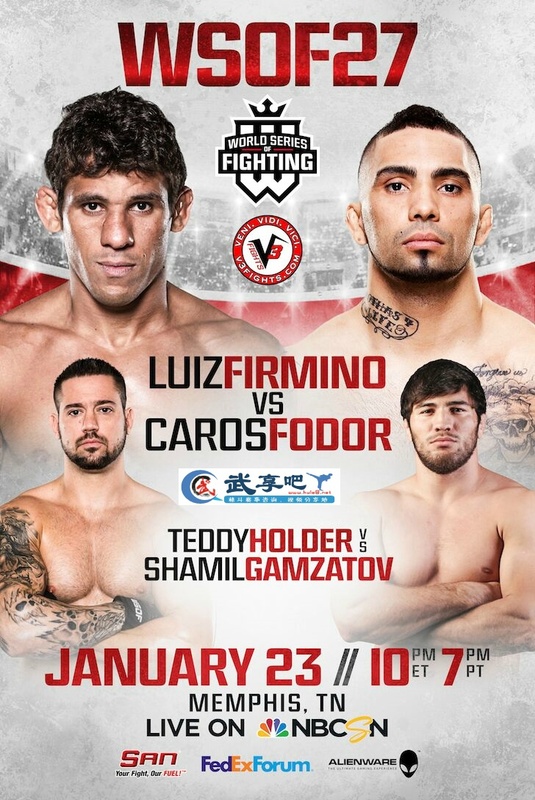 2016年1月23日（北京时间1月24日）WSOF 27期举行，头条主赛为“Firmino vs. Fodor,” 的对决，下面武享吧精选由”霸道神父“上传的本次主赛和副赛视频。was headlined by a showdown between Strikeforce, UFC and ONE Championship veteran Caros Fodor making his WSOF debut. He clashed with Brazilian Luiz Firmino, who entered the decagon riding a five-fight winning streak. The co-main event featured a battle between light heavyweights Teddy Holder and Shamil Gamzatov. The World Series of Fighting was back in action on Saturday, Jan. 23, with its 27th event from The Theater at FedExForum in Memphis, Tenn. In the night’s main event, Strikeforce, UFC and ONE Championship veteran Caros Fodor made his promotional debut. He clashed with Brazilian Luiz Firmino, who entered the cage riding a five-fight winning streak. Fodor opened his Strikeforce tenure with five straight wins, but after falling to Pat Healy, he fell to Sam Stout in his lone UFC appearance. He rebounded under the ONE banner, winning three of his four appearance. Firmino, meanwhile, had scored back-to-back wins inside the WSOF cage over UFC veterans Jacob Volkmann and Tyson Griffin. He also holds a win over two-time WSOF title challenger Luis Palomino. The co-main event featured light heavyweights Teddy Holder and Shamil Gamzatov. Holder looked to bounce back from a loss to current WSOF light heavyweight and middleweight champion David Branch. The pair met in the promotion’s 205-pound tournament final after Holder shockingly stopped UFC veteran Thiago Silva in the semifinals. The Russian Gamzatov was making his promotional debut. The 25-year-old carried an unblemished record of 9-0, with all of his wins coming before the final bell. Space isn’t just the final frontier, it was the story of this fight. When Caros Fodor had it, he had some good moments. When he didn’t, which was most of the fight, he was completely neutralized. Credit to Luiz Firmino, the victor by unanimous decision in this one. He is no stranger to a dog fight but he knew coming in that even if he could have beaten Fodor in that fight, he was taking more risk than necessary. The real genius of game plan was how much time was spent, ala Eddie Alvarez, against the cage. What that allows is you to control the fight but neutralize your opponents submission game, which he almost fell prey to in the first. Fodor excels on the ground and with space, Firmino gave him limited opportunities in either area. I would be closer to agreeing with Ali Abdel-Aziz, former VP of WSOF, in saying that neither of these guys is ready for Lightweight champ, Justin Gaethje. However, I will say this, if Firmino could close the distance on Gaethje it would be interesting to see how the champ responds to that. From Russia throwing gloves. Shamil Gamzatov made his U.S. debut by knocking Teddy Holder’s block off for a first round TKO victory. It is said in a fight that you need to protect yourself at all times but it must be mentioned that there was a bit of awkwardness seconds before the knockout. Holder felt his eye was poked and he and Gamzatov were unsure if they were fighting or stopping. When the fight resumed it was an overhand right that dotted the aforementioned eye and that was the beginning of the end for Holder, who ultimately finished on the ground with strikes. The right was the deciding blow as Herb Dean flew over to call the fight over. Thug Nasty, Nasty Thug. The kid, Bryce Mitchell went in there and made short work of Jorge Medina. The fight started with Medina executing a beautiful judo throw in a scramble. Next thing he knew, he wasn’t breathing. It was that quick. The kid found his neck and took him to the darkness. The main card began with some young welterweights on the rise, Jaleel Willis and Chauncey Foxworth. We thought going in it would be determined by who controlled the level. Willis held the edge on the ground (wrestling) while Foxworth was better on the feet. That’s exactly how it went as Willis spent the majority of the fight in top position. He did get cut and there was alot of blood but it didn’t slow down the wrestling and he steamrolled Foxworth to a unanimous decision win. The final fight of the prelims was a fight that had everything you want if you are a fan of MMA. Great work both on the feet and the ground, as Wade Johnson dominated the stand-up and Justin Hartley dominated the ground game. In the end 2 of the 3 judges liked more of what they saw from Johnson on his feet and awarded him the split decision. This was a great fight, and even though the guys seemed gassed at the end, they fought until the horn. Another quick one in the second fight as Jason “The Trouble Maker” Williams did just that to Zach “Thunderwood” Underwood. A monster right hand to the rib cage looked to be what took the thunder out of the young lightweight. However, reports coming out of the event are that a knee injury may have been the cause of Underwood’s short night. The night began with Alvin Williams vs Wes Sharp, two lightweights with varying backgrounds. The 25 year old Williams, a certified head-hunter came out and made short work of “The Punching Preacher”. He sent him back to the congregation, in just 30 seconds and started the show off with a bang. Huge KO win for Williams in a big spot. In closing, we’ll echo Dana White in saying, that you can’t judge these fights until they are fought. This card turned out to be pretty entertaining even though fans may not have been familiar with some of the names when it started. Jaleel Willis needs to show more before I am ready to anoint him, a true prospect at 170 lbs. but Mitchell looked good and so did Gamzatov. Great night of fights.